One of the more passionately discussed films at the 2015 New York Korean Film Festival, held at the Museum of the Moving Image, crept up rather by surprise in the form of the thoroughly independent production CONFESSION. Its somber and unostentatious presentation of a moral quandary faced by three authentically depicted friends left viewers with plenty to think about. 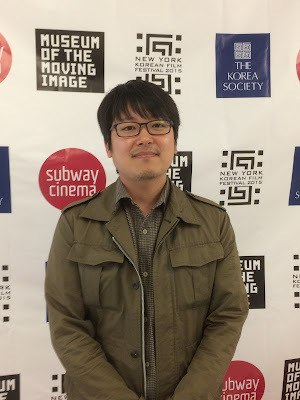 I had a chance to speak to the film’s director Lee Do-yun before he presented his debut feature at its New York premiere. Our brief conversation revealed that there are some heady ideas on the mind of Lee, which will continue to pervade his work, as he is already at work on his next feature. Mondocurry: What made it possible to get the backing to make this, your first feature film? Lee Do-yun: This film has been on the shelf for about four years. It sort of went from production company to production company without finding the right investors. I’ve had a lot of investors saying we can’t make it because it’s not a commercial film. Then Opus Pictures, which is the production company I worked with this time, they were because they dealt with production and were also an investor company. The producer from that company took a look at my screenplay and said he wanted to try his hand at production and also wanted to try to finance the film. So we were able to do that together with the production company. If it weren’t for that company, this project would not have been able to take off at all. MC: Was this the film you always had in mind for your first feature? LD: This has been a film that I’ve been wanting to do for a long time. This is a little behind the story but there is actually a second film I confirmed doing for this production company. It has just been confirmed. But that's a commercial film. When I was talking with the head of the company, he said he wanted to do that first. But I told him that without doing CONFESSION first, as a director I felt I would be burdened so much. So In a way I was stubborn about having to do this film before going on to the second film. Making CONFESSION actually sort of helped me turn a page in my life, if you will, as a sort of ending chapter of one stage in my life. It’s like a turning point that I’ve been able to move on from. MC: The movie has a very genuine feel to it. Is it based on an personal experience? LD: I feel like it’s not formed only from a particular experience in my life. I thought about it as a film about values. When you look at human relationships, they aren’t just black and white or good and evil. In real life, a person you’re having a relationship with may seem like a good person one day and on the next they seem like a bad person. I think that is exactly what human nature is like. We are constantly shifting. So I thought that it would be interesting to tell a story about that through a group of three friends. I think, ultimately I wanted to pose a question to the viewers: ‘who am I?’ and ‘what would I do?’ So I would say it doesn't come from a particular event, but from 36 years of being alive on this planet and having relationships. That experience sort of seeped into the story that I wanted to tell in CONFESSION. MC: Was it originally conceived as a movie or another medium? LD: When this story was originally thought of, I wanted the medium to be film. I think it differs… Some stories are told better through words and others through imagery and I thought CONFESSIONS in this case is more the latter than the former. When I first conceived of the story, it started from an image of a man asking the culprits that murdered his parents to help him find who were the culprits. That was the image I started from. MC: It seems there are many societal forces affecting character’ actions. Did you want to say something about one’s surroundings influencing their decisions as opposed to their inherent human nature? LD: I basically believe human nature is very susceptible to one’s environment. For instance, we right now all are cozy in this New York world but around the world there are wars going on and people are suffering… I think the thing that really defines who you are as a person comes when we are placed in extreme circumstances and it depends on what choice we make in those circumstances. I feel that Korean society nowadays really forces a choice against our wills. Unfortunately it’s just the way things are. Basically I really want to challenge people about their beliefs that they are being a good person or a bad person. Would those really hold up in an extreme circumstances? That's what I want to question. I feel like I’m more interested in characters that are not born to be heroes or villains. I like to deal with characters that become a hero or villain depending on the choice you make. The stories I really like to tell are about characters who are not in that decision making process at first, but we see them go through it. And then they become a hero or a villain. I think that is also my goal as a director: to portray human beings in that sort of context. MC: You mentioned another film is in the works and will be a commercial one. Will it be very different than CONFESSION? LD: I wouldn't say it’s entirely different from CONFESSION because, although it takes on the genre of an action thriller film, it’s about a journalist and terrorist who are trying to get what they want. Both of them have different goals and they’re trying to get them but I think that similarly to CONFESSION it keeps on dealing with the choices we are confronted with and the consequences that arise from the choices we make. So yes I think it still follows the same thread in that I want to ask the question of how we maintain our integrity as human beings. MC: Is there anyone you have an aspiration to work with, or anyone you worked with on CONFESSION that you would like to collaborate with again? LD: I’m about to work on the screenplay of the next movie. Ju Ji-hoon, who played in-chul in CONFESSION, is actually unofficially confirmed to play one of the leading roles in it. It was a great experience for me working with the actors on CONFESSION so I’m happy to be working with him again. During the time between filming CONFESSION and now, he’s grown quite a bit in visibility and popularity so he’s a good asset to have on the film. We’re still in the casting process right now. There are some very good actors in Korea, so I need to get back and see who I want to work with. For more information about the New York Korean Film Festival, visit its website here.